As more and more companies explore the possibility of hiring Direct Primary Care (DPC) practices to care for their employees’ healthcare needs, more will ask how DPC compares to the status quo in terms of cost and quality. Nextera Healthcare and Digital Globe answered this very question. In 2015, Digital Globe, a national security company, hired Nextera Healthcare, DPC practice located in Longmont, CO, to provide DPC services to its members for a 6 month trial period. Digital Globe also provided insurance to pair with DPC membership. At the end of the trial the insurance company analyzed the results of the trial, showing a reduction in overall healthcare costs for employees as well as an improvement in their overall health for members of the DPC practice compared to non-members. The results of this trial were published in a white paper the following year (see above). In this episode Dr Roussel interviews Dr Clint Flanagan, founder of Nextera Healthcare, about this collaboration. How did it begin? What did the agreement entail? What were the results? And importantly, how can this partnership serve as a model to other DPC practices and companies to collaborate? [2:15] So Dr Flanagan, can you tell me about your partnership with Digital Globe. How did it begin? [3:07] Once your formed the partnership, how did this partnership form in terms of working with human resources to form more formal agreement? [4:55] How did the clinic reach out to patients to fold them into the flock? What kind of insurance did patients have? [5:00] Dr Flanagan describes the pilot study: how it was done with employees who got DPC versus those who didn’t. [7:10] What kind of insurance did employees have when the trial took place? [9:03] What kind of quality metrics were used to measure health of employees? [10:12] What were results of the study in terms of cost? [11:49] What is the state of your partnership now? [13:32] What would you suggest to other DPC practices who are looking to work with companies to offer DPC as an employee benefit? 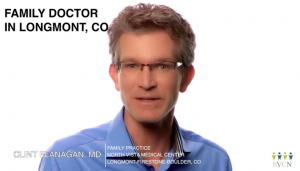 Dr Clint Flanagan is a family doctor from Colorado. He started Nextera Healthcare in 2009 and now serves as the company’s CEO, in addition to being a DPC doctor.